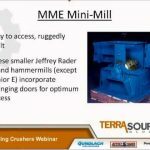 TerraSource Global’s Jeffrey Rader sample crushers are ideal equipment for moderate-volume sampling applications. These smaller hammermills keep the same high capacity range as our larger mills and are a cost-effective solution for facilities with space constraints. Click here to learn more about the additional benefits of partnering with TerraSource Global for your sample crusher. We manufacture multiple models of our sample crushers. The following are common specifications of our models.